Many people ask about CDN support. 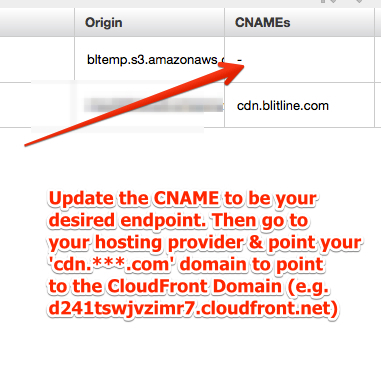 Most modern cloud providers allow you to do this YOURSELF for pennies. There is little reason for Blitline to act as a middle-man and charge your for something that is so simple to implement using your own current provider. This is the explanation on how to do it yourself on S3. It will take a while for the CDN to populate. Wait for the “In Progress” to complete. Considering how inexpensive S3 is for CDN, it’s hard to imagine many reasons why you wouldn’t just CDN your own buckets and save the expense of many of the other “CDN” providers. If you have any questions about turning your bucket into a CDN, you can write us at support@blitline.com and we’d be happy to help you out!